"Creativity has no place in this school." CBS Films has debuted a second full-length trailer for the movie Middle School: The Worst Years of My Life, an adaptation of the bestselling book series of the same name. Young actor Griffin Gluck stars as Rafe Katchadorian, a boy with a "wild imagination" bored of middle school who decides to break every rule and see what happens, bringing his friends with him. The full cast includes Lauren Graham, Rob Riggle, Thomas Barbusca, Andy Daly, Adam Pally, and Efren Ramirez. This actually looks really fun, especially disregarding the rules and messing with expectations. I'm sure if I were younger I'd enjoy it even more, but still, it looks pretty good. "Rules aren't for everyone!" You can also still watch the first official teaser trailer for Middle School here, to see even more footage. A quiet teenage artist Rafe Katchadorian (played by Griffin Gluck) has a wild imagination and is sick of middle school and the rules that have been put before him. Rafe and his best friend Leo have come up with a plan: break every rule in the school hand book and as you expect trouble follows. Middle School: The Worst Years of My Life is directed by filmmaker Steve Carr, of Next Friday, Dr. Dolittle 2, Daddy Day Care, Are We Done Yet? and Paul Blart: Mall Cop previously. The screenplay is adapted by Chris Bowman & Hubbel Palmer and Kara Holden; based on the novel by James Patterson & Chris Tebbetts. 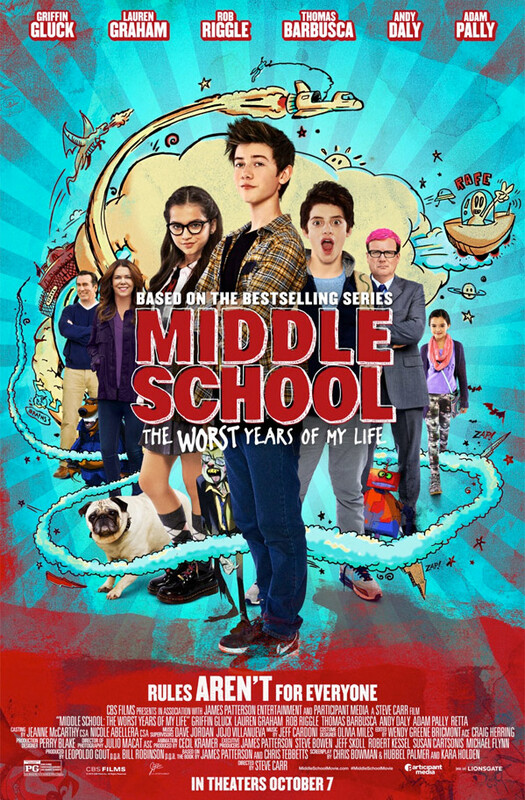 CBS Films will release Middle School: The Worst Years of My Life in theaters on October 7th this fall. Anyone interested? We Do Not Sow. We take what is ours. Yeah stick to the maaaan. they should all be maced and cable tied the mad anarchists.